This entry was posted in Racing on May 25, 2011 by Steve Tilford. When I was a child I was hurt all the time. Stitches, broken bones, ruptured spleen, hit by cars, you name it, it happened. When I was 11 or so I was picking apples for my best friend’s grandmother. I wasn’t that high in the tree, maybe 6 feet up. The branch I was standing on broke when I had my hands full of apples, so I fell. 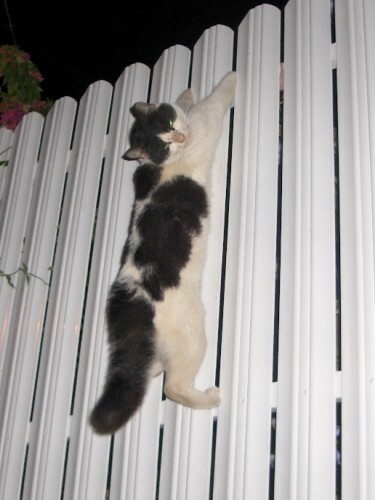 I landed on a picket fence, hanging by my armpit, with my feet not touching the ground. I had a paper boy bag over my shoulder full of apples, so it was pretty hard dislodging myself from my situation. I put my hand under my armpit and realized it wasn’t good. My friend’s grandmother had missed the whole accident and I was concerned that the blood was going to really upset her. I told her I had to go home because I’d cut my foot, barefoot as I was, of course. Running down her driveway, I took my t-shirt off and stuffed it under my arm because I was bleeding pretty good. It was a weekend and when I got home, both my parents were there. They were pretty used to me being hurt. My dad said he’d take me to the emergency room, which was out of character for him. So, back to the ER. I was there all the time and wasn’t the least bit stressed about it. We checked in and had to sit there for at least an hour. I started feeling weird and told my dad I needed something to drink. He asked the nurse if I could have something to drink because I was feeling light headed. She said it was better if I didn’t drink anything for some reason. Pretty soon they called my name and when I stood up I had a head rush. You know the kind you get after you’ve done a long ride and stand up too quickly. Anyway, I teetered a bit and dropped the t-shirt that was still stuffed up in my underarm. It hit the floor with a splat and blood was everywhere. Lots and lots of blood. They rushed me back and a doctor was there immediately. I had just nicked the artery running to my arm and it was spurting blood pretty good. I had never seen a doctor mad before and he was crazy made at the nurses. Anyway, it all turned out okay and I was fine. Yesterday I did something that I thought would have been totally impossible. 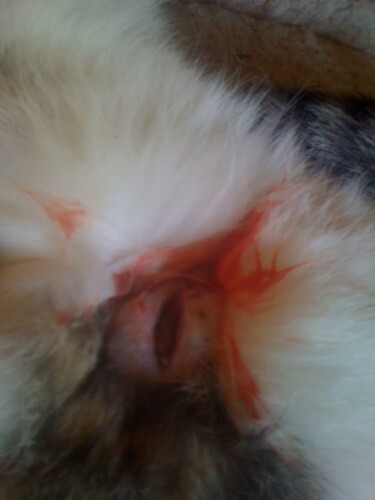 I stitched up a cat. 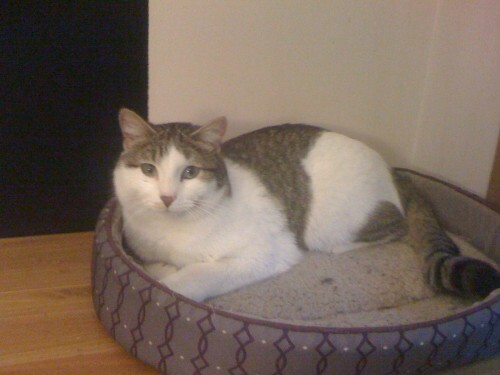 Fritz, the white kitten from a few months back, was laying in his cat bed and Kris noticed that he was cut up. A pretty big wound. I was about to take him to the vet, but then I though that maybe I could do it. It wasn’t the money or anything, it was that I knew that they would have had to put the cat under general anesthesia. I haven’t had a very good track record with pets under anesthesia. I haven’t had a very good track record under general anesthesia either. So, I did it. I still can’t believe it. This cat should be a dog. It squirmed a couple times, but it was great. The only problem is that the only sutures I had, the needle was super small and the suture material was exactly the same color as Fritz’s white fur, and really thin. I was having a super problem typing the knots. It took a while and I was pretty torched from the stress afterward. I realize that I”m going to have a very hard time finding the stitches and removing them. I left a pretty good amount of suture sticking out, but I still think it is going to take awhile. I bet I leave one in. I’m taking the feral cat that is living in my bathroom, with the one remaining kitten, to my vet this afternoon. I’m going to ask him for some antibiotics for Fritz then. Anyway, I thought of the picket fence story because a couple years ago I was inspecting myself for ticks after being out with Bromont and I was looking in my underarm and thought there was a tick. But it wasn’t, it was a stitch left in from way back. I thought it was amazing that it could have lasted there that long. So, I’m not that worried about missing one in the cat. Very cool. I’m a cat caretaker too. ….and that is why I usually check in here about every day. Not the typical cycling blog, which is a good thing. Nice work, I hope you put a little Neosporin in the cut. Excellent work as a stitch in Fritz not only saves time but also averts a monetary CATastrophe. Local-yes. Sterile-as sterile as I could get. I’m not sure it is practicing medicine? I think that sould only apply to humans. Maybe not? But, if that is the case, then virtually every farmer that has livestock is practicing medicine without a license. 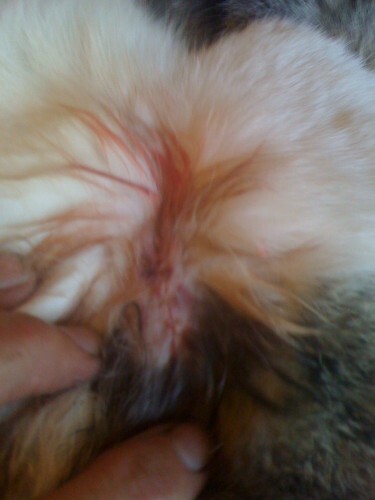 I showed the photos to my Vet and asked him for some oral antibiotics, which he prescribed. The cat is doing great.